Come join us for Southbound Blues now running in it’s second year. Enjoy a excellent night under the beautiful and ever-changing lights of the Cumberland Park stage. From 7PM to 8PM: we will have an instructor available to teach you the basics of blues dancing and other intermediate skills as you request. From 8PM to 1030PM: we will have great local and guest DJs spinning traditional blues tunes for you to dance to until the park closes. And did we mention it’s completely FREE? We do encourage bringing a small donation to cover DJ expenses and water that will be provided, but we will not be charging for this event all summer long. We recommend NOT parking in this area. 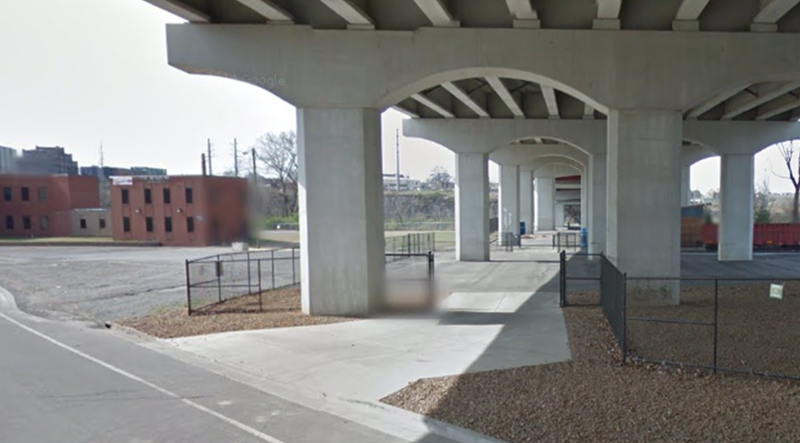 While this gate does lead to parking that is “supposed” to be for Cumberland Park, the railroad company controls the gate and could shut it at anytime, leaving you stranded until you can contact them. We recommend parking in the Green highlighted area. 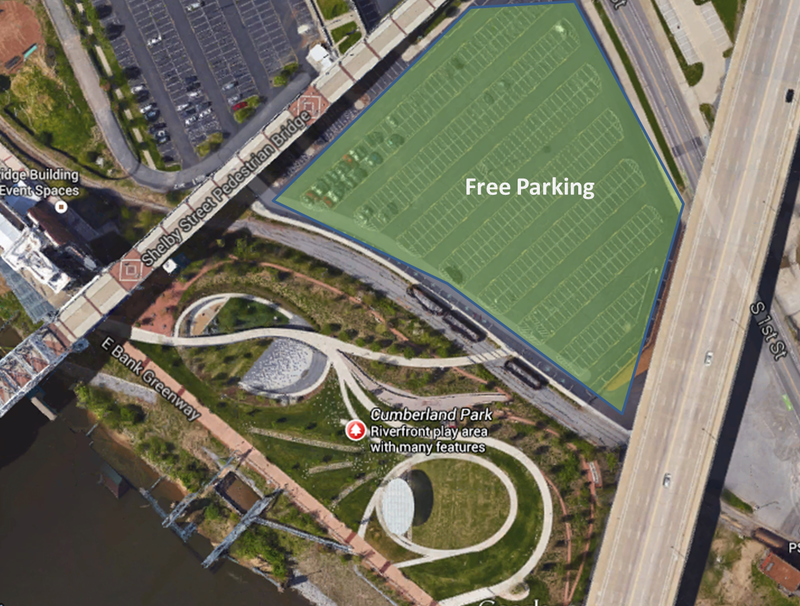 These parking spaces are free during the summer since there are no Titans games. There is one Southbound game during a Titans preseason game (Sept 3rd), so we’ll have to navigate parking differently when that day comes. Southbound will continue running during rain so long as we determine there’s no chance of lightening or tornadoes. We value everyone’s safety so if you see a Thunder Storm or Tornado Warning/Watch, you can guarantee that we will not be there. We will make every effort by posting to social media, emailing and calling our subscription list in order to get the word out of a cancellation and possible relocation site for the night. We thank you in advance for your help and understanding and look forward to dancing with you this summer!! Meghan has been a dancer her entire life. She learned how to “jitterbug” at the kitchen sink with her Mom when she was only 10 years old, and has loved all forms of swing dancing ever since. From 2006 – 2010, Meghan spent a great deal of time studying and teaching Blues, Lindy Hop, Charleston and Balboa both in the US and in Europe. 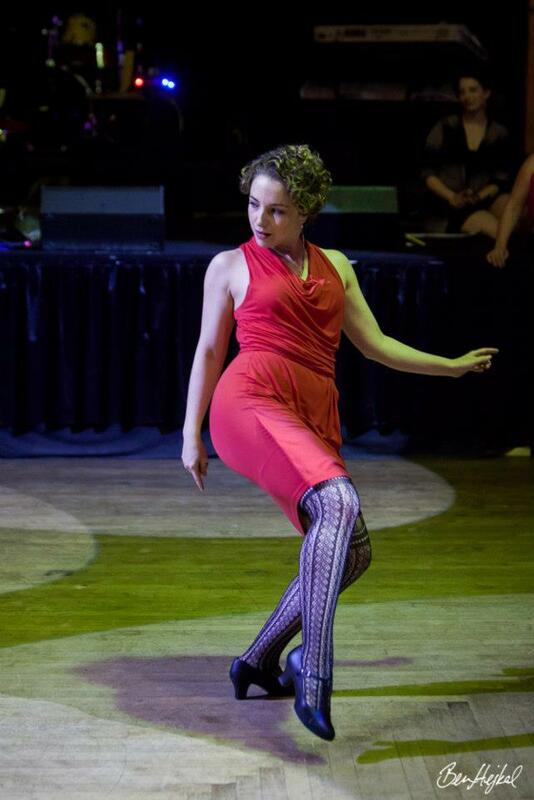 After traveling and teaching, she landed in Memphis, and has been teaching with Red Hot Lindy Hop, ever since. Look for her shakin’ it on Beale St. or Rumba Room in Memphis as well as at other Blues and Lindy events nationwide. Meghan’s background in theatre has bled in to her dancing where often times music will create a character, a story, or just a feeling that will inspire her expressiveness and creativity with that partner in that moment. She is always seeking to hit that perfect balance between listening to the music, her partner, and the dance they are creating together. Her teaching style focuses on developing great technique, deepening the understanding of different connections and learning to let the music lead and inspire. She will always be grateful for her time with “the greats” – Frankie Manning and Dawn Hampton, who inspire her to always find the joy in this fabulous dance we are privileged to keep alive. Most recently, Meghan took first place in the Solo Blues Competition at Winter Blues in South Carolina – check her out here.